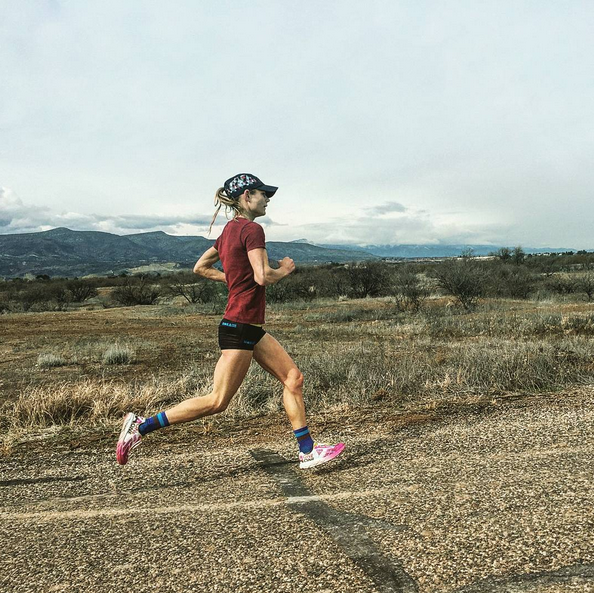 After a stellar debut marathon, Kellyn Taylor will be in the hunt for a spot on the Olympic marathon team. Women’s Running: You had an incredible marathon debut in Houston in 2015. What’s the last year of training been like following that 2:28:40 and knowing that you are a definite contender for a spot on the 2016 marathon team? Kellyn Taylor: Thank you! The last year has had its ups and downs but overall has been good. Thankfully I was healthy all year with little to no setbacks. Track didn’t go quite as I had envisioned but I was still able to walk away from the season with a bronze at the Pan American Games in the 5,000 meters. My fall was filled with a lot of miles and more marathon specific work which resulted in mediocre performances. To be honest the focus of the last half of the past year has been the marathon and everything else has been icing. Hopefully this will all pay off on Feb. 13! WR: Your story is compelling and also unique—pursuing two incredible dreams at once! How would you say training for the Olympic Trials Marathon helps prepare you for a potential job as a firefighter after you’re done racing? KT: I feel very fortunate to have found two careers that I love. I absolutely love running and that is my main focus right now but I also can’t help but be excited for the next chapter of my life when I am a firefighter. Training for the marathon trials is a grind. It’s meticulous and structured. I imagine that much of firefighting is the same. You do the same gear and apparatus checks day in and day out. Run a lot of “routine” calls (no call is routine but many are similar). Then you get that one call or get to race that one race. The call that makes you put your best foot forward and use all of the knowledge that you have in order to put out the fire and keep everyone safe. The race that shows all of your hard work has finally paid off. I enjoy the day to day things but I’m looking forward to those big days as well. WR: What’s the wildest thing you’ve ever seen or experienced during a training run? KT: Most runs are pretty standard. I’ve had the “I’m so cold I don’t think I can finish this run” moments. Seen Elk, deer, wolves, foxes, and other wildlife. One time I was running and came upon a overturned jeep on a rural, not well traveled road in Flagstaff. Everyone was okay, but they were visibly shaken up. WR: Since you had an incredible marathon debut yourself, what would be your words of wisdom for those pursuing their debut at the LA Marathon on February 14? WR: Be patient. The marathon is a very long race and in most cases a half is the farthest a new marathoner has raced. They are very different races and you can easily get yourself in trouble by forgetting that. Enjoy the race and realize that it is a distance that takes experience to perfect. My first one went well but I also took a lot away from it and it has helped with my build up to the trials. WR: You recently visited the LA course with your team, Northern Arizona Elite—what advantages do you think it offers runners to see a course before racing on it? KT: Having been able to view the course several weeks in advance will give us time to mentally and physically prepare for the race. It was good to see the terrain and to see the large number of turns. We have altered some runs and done extra strengthening to account for the turns. It also helps to build some excitement. The Olympic Trials is exciting in itself but actually being at the course and running it helped me visualize my trials race.